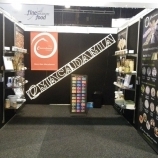 We decided early in the year to exhibit at the Fine Food NZ Show, a trade only show as opposed to the consumer Food Shows. We wanted to spread the word and broaden our customer base. We are also interested in exporting. 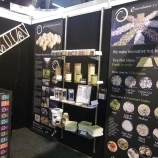 We have attended several Fine Food Shows in Melbourne as visitors over the years and the first New Zealand show two years ago. 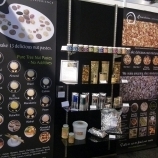 It is quite a challenge to design banners that showcase what we can do, put together information kits, hunt out clear plastic and glass containers to display our nut slices in the various grades and bar mixes and try to build an exhibit that informs but does not confuse. We hunted out our electronic sign last used at WOMAD 2007, sandwiched it up between layers of polystyrene and hard board and freighted it up to Auckland. We drove up on Saturday 16th loaded up with everything but the proverbial kitchen sink. 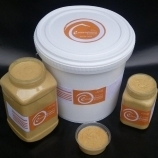 We entered our Peanut Free Peanut Butter paste in the new product category. This is a salted tree nut paste that tastes like peanut butter but is not made from peanuts. It is aimed at pregnant and nursing mothers and young children as well as those who know they are allergic to peanuts. A sample of this, along with other nut pastes, was included in the information kits. Interest in this new paste ranged from those involved in school canteens to those feeding the elderly in Aged Care and of course the Asian satay sauce applications. The show ran over Sunday, Monday, Tuesday and an average of 2000 people a day visited the ASB Showgrounds. We looked good and enjoyed meeting a wide range of people and talking with other exhibitors. Now we are in the follow up phase. While we were up in Auckland the June edition of the Cuisine magazine arrived in the shops. It featured an article on food tourism in Taranaki entitled Coastal Chill. 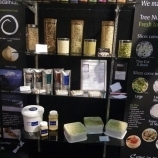 The tourism side of our business gets a mention along with our factory, The Nutcracker Suite, our macadamia and other nut products. See our TOUR section to read this article.